The Nature Trail - Stop No.2. We have actually walked between stops 1 & 2 to pace our 100m but lets look at some of the other hedgerow plants we have seen. Here pictured in flower with a bee busy (see if you can spot it) collecting the pollen. 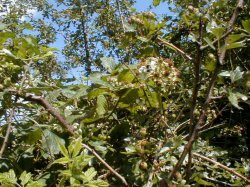 Later in the year they will produce the blackberry fruit (delicious in pies). 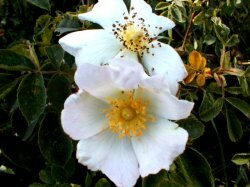 This picture shows the rose in flower but when the flowers have finished the rosehips will appear. Some people boil them with sugar to make rosehip syrup a traditional cold remedy.